The Gripping Beast plastics are a fantastic product, and I have purchased at least one box of all of their releases. 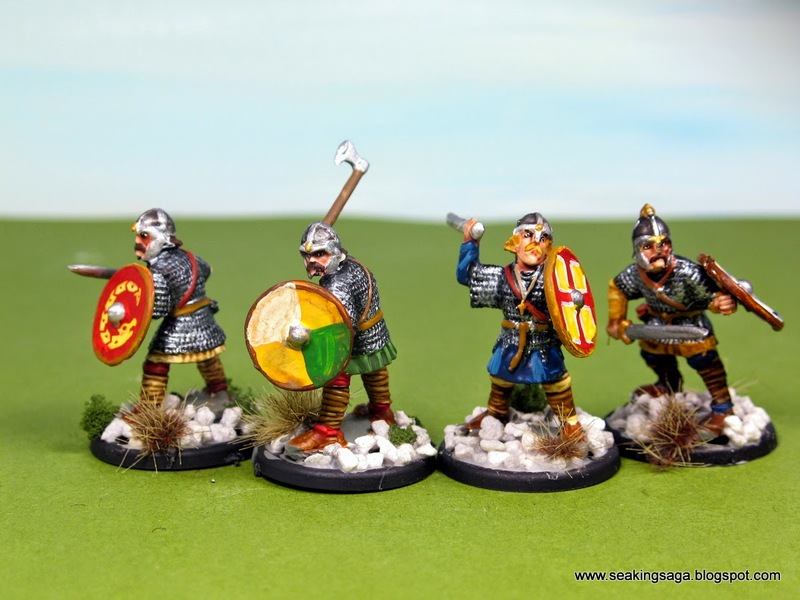 However, the Saxons were one that never caught on for me. 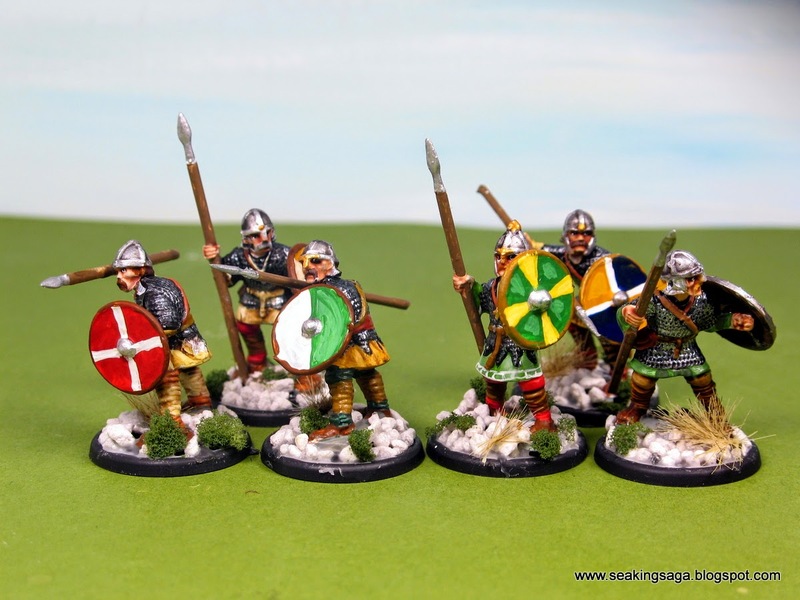 Originally purchased for some Viking and Saxon matchups inspired by Bernard Cornwell's Uhtred series, I assembled the Saxon Thegns, but never got around to painting them. Other new shiny things caught my eye and a couple of years passed by. As a firm believer in delayed gratification, I thought I would attack the Lead and Plastic mountain from the direction of items that had been in it the longest, rather than recent or more desirable projects. So pulled them out last week and got to work. After drying, I add bits of moss (green foam) and grass clumps. 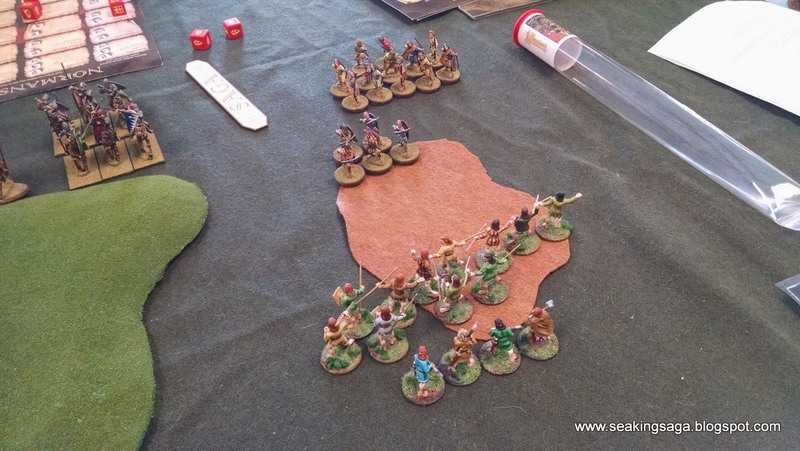 I have no real plans to ever play the Anglo-Saxon board in SAGA nor do I have the time or money to build a Hail Caesar size army so maybe they will end up for sale. I might interested in seeing what is the going rate for some painted minis on eBay or TMP. Miniature bases are not something that I will make a fuss about. I have bought plastics from various manufacturers, wood discs from craft stores and of course, metal washers. Plastic is my preference but if it is 30mm round or 25mm square, it will probably do. Occasionally however, the search for bases leads to a genuinely cool find. I stumbled across Proxie Models on eBay, but their webstore is just as good and probably better for the company's return on the dollar. The bases themselves are black and with a slight textured surface. That possibly helps material adhere better to the plastic, or it may just look good. 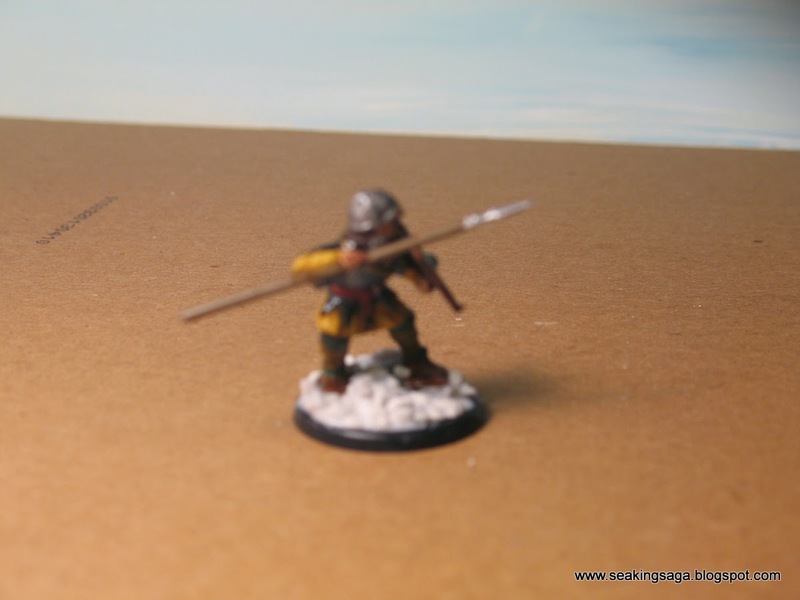 A $4.50 package contains four sprues of eight bases. Added bonus - the round center sprue makes a good stump or log for terrain builders. 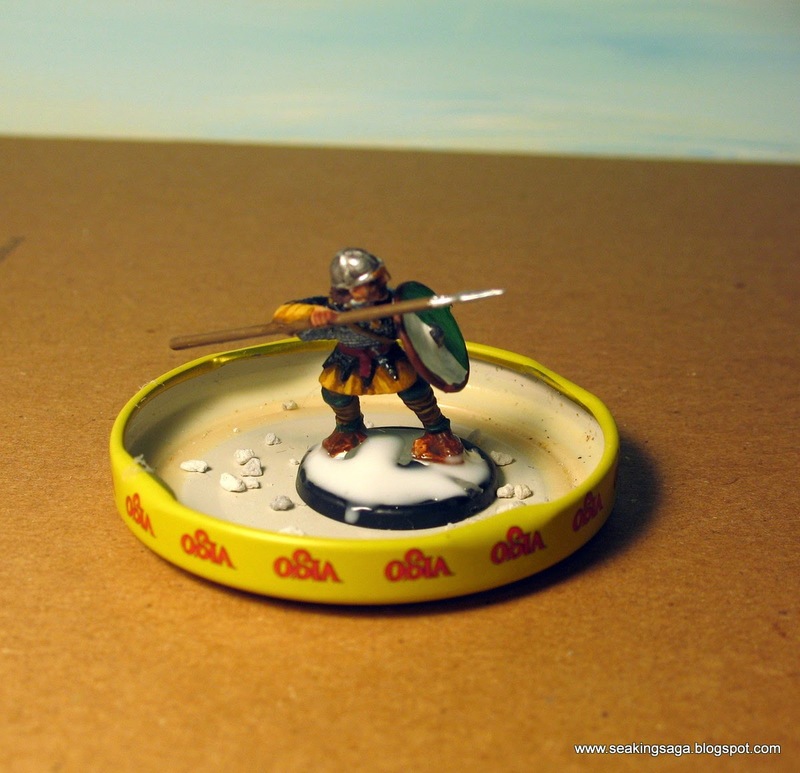 The bases have a slight lip, which is convenient if you are adding some kind of basing material. I like a mixture of fine sand, latex caulk and paint. The base edge creates a nice border which holds the material better than a flat base. Their products are made in the USA and shipping speed is excellent. I have placed two orders with them so far, and my bases arrived in less than a week. They also have some 28mm modern/futuristic terrain, including a pre-fab building that makes me want to play Fallout 3 with miniatures. We do have game stores in small towns of Georgia, though they tend to focus on Magic and other CCGs. I am starting to see some X-Wing in local stores, but if the miniatures are pre-painted, aren't I losing half the fun? Gigabytes, my favorite game store in the Atlanta area, is a great place to visit when I can get away and look for an authentic game store experience. The store supports a wide variety of sci-fi, fantasy and historical games and they have a new, larger location. Yesterday (Sept 13), the store was the location for a SAGA tournament and so me and another local player made the trip down the interstate to the big city. It was a great day all around, largely because of the expertise of Richard, the tournament organizer and the other players, all a great bunch of gamers. I had been playing the Irish a lot lately, and I felt like I had a good feel for what they could do. Here I played against Vikings. We chose terrain according to bid system in the basic rules and I went for maximum, with four being the result. I made the most of the terrain throughout the match. 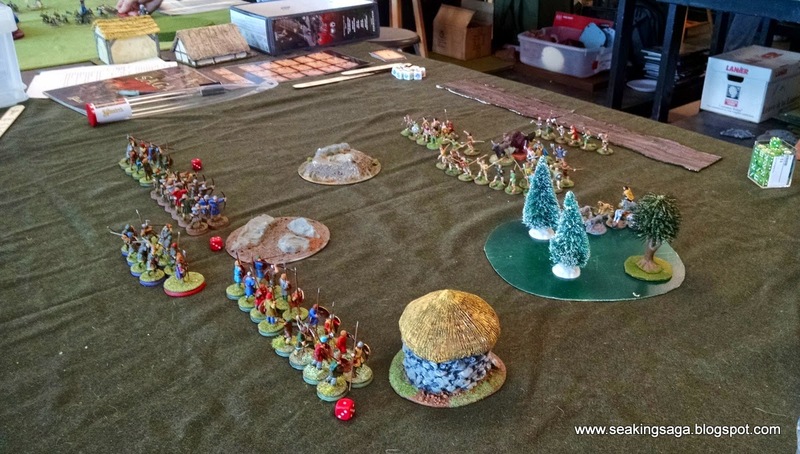 Most of my SAGA dice were spent on Sons of Dana (a free shooting) and blocking the opponent with Heirs of Mil (which prevent units from approaching a unit if it is S away). If I had to stand and fight, I tried to make sure I could use Sidh on them. On turn six, I was probably leading in victory points, and so the opposing warlord took a risk and attacked...but the dogs won. If this had gone the other way, I did have a unit of hearthguard in reserve that could have double activated and hit the warlord - but as it turned out I was far enough ahead in points to win. In addition to my warlord and two curadhs surviving, a whole unit or warriors and hearthguard survived untouched. My opponent in this match was Henry at Plastic Pirates. He was a great guy to talk with, and was enthusiastic about the game. Hope to meet him again! I really, really, really did not want to be the baggage player in this scenario. It was determined by low bid and I stupidly bid 5 points. My opponent was playing Anglo-Danes and with their intimidation and cancellation abilities his desire for the attacker should have been a given. The set-up: Anglo-Danes closet to the camera, the Irish and baggage on the other side. 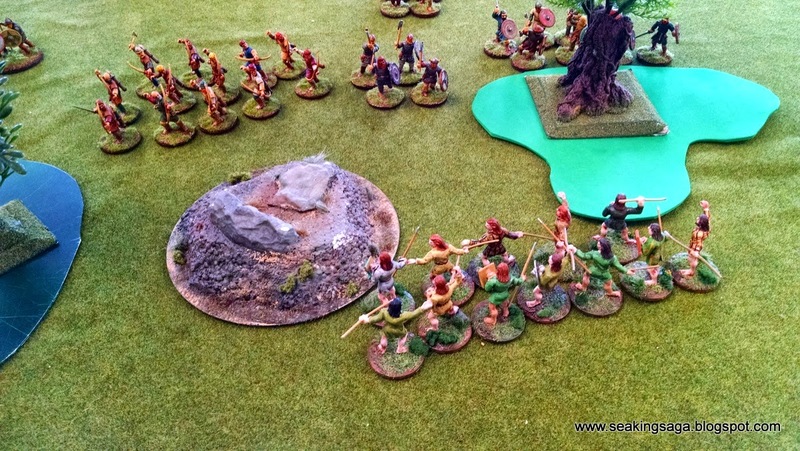 Mu whole strategy was to whittle down his units with Sons of Dana. Then, open a lane with levy or warriors protected by Heirs of Mil, and then move the baggage behind it. His strategy was to place fatigues on my baggage, and half their movement or cancel it entirely until the turn count ran out. But, he still had to destroy all three units for an uncontested win. So I just moved and shielded baggage as best I could. I would like to say that I was intentionally playing for a draw because that was the best I could do against the Anglo-Danes. I could say that, but in reality a good dice roll saved me from a total loss. On the last phase of the last turn, I lost two of the three baggage pieces, and barely survived the third. In this round, my opponent was Skip, who I drove down with and he is my somewhat regular gaming opponent. 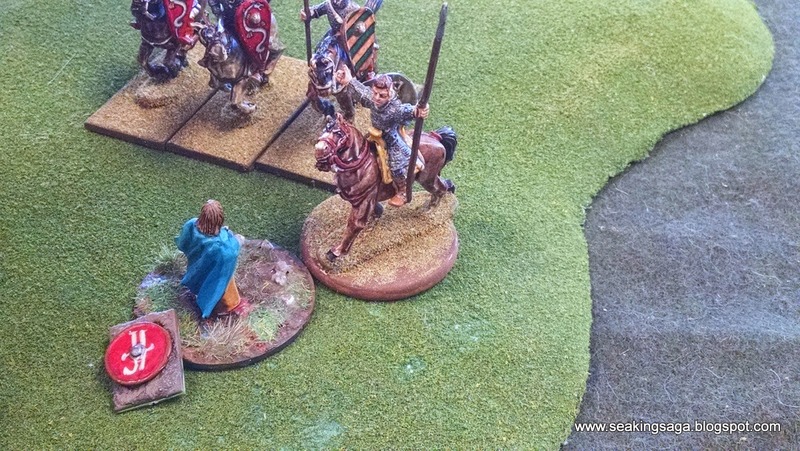 He brought his Old Glory Normans. 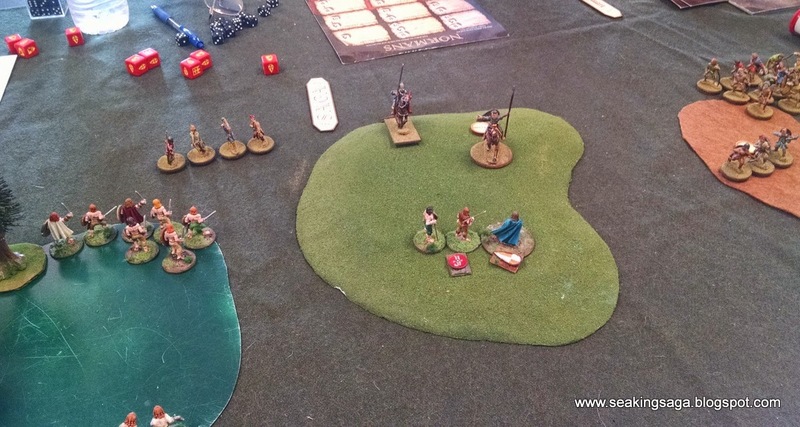 Winning initiative and following the scenario rules were critical in determining the victor. 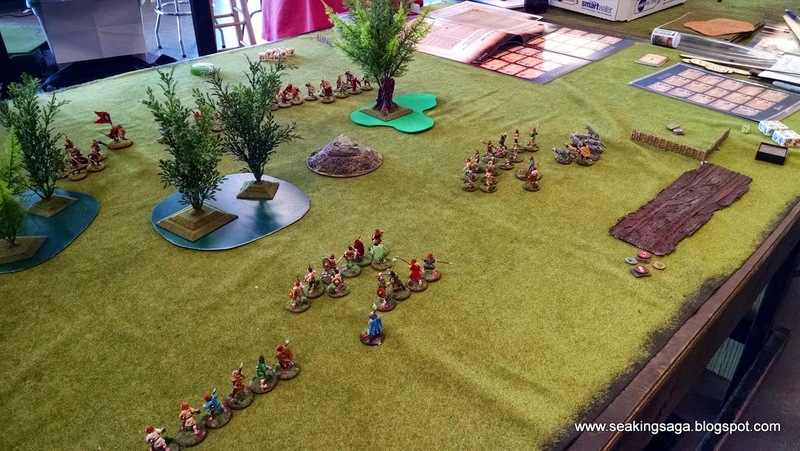 At the end of each player's phase, the number of opposing models on the three terrain pieces are scored. I won initiative, and my opponent had no chance of scoring at the end of my phase. By doing a double activation, I placed two units on a terrain piece, played Heirs of Mil on them, and they remained there at the end of his phase, scoring me eight points. This extra score was very significant, although I did not realize it at the time. 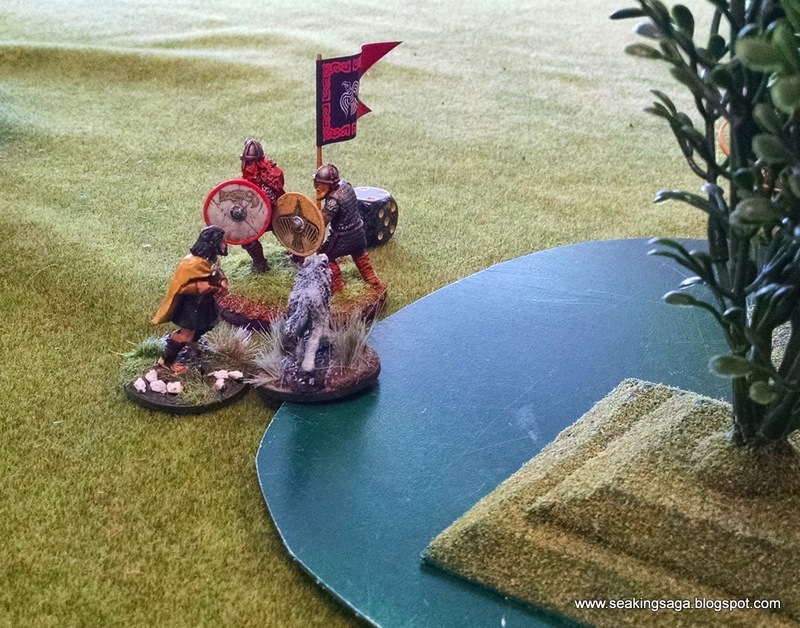 The Norman cavalry scored a lot of points when he put two units of six on a terrain piece, but then lost some of those points, as eight was the maximum scoreable amount per area. The most dramatic moment of the game was showdown between the two warlords. I played Blood of the Kings and sloughed off three hits. My warlord then brought up three warriors who were (I think) able to take out two of the knights with a missile attack. After eight rounds, the points were added up and it was a more close than comfortable win for my Irish. Skip is the most gracious and friendly gamer I have ever met. He is the type of opponent who reminds you when he has fatigue and asks if you want to use it against him. In fact, he won the Favorite Opponent Award, and walked away with a hero figure pack. The pre-game portion of this scenario was again based on bidding - Each player offered a number of points they were willing to be the defender. With the Irish, I announced that I wished to be the raider, and would bid six. My opponent saw things the same way, so we had to roll off to play defense and I lost - but I at least got my six points. I played no curadhs and no dogs - I needed more bodies to occupy the buildings. My opponent had the choice of terrain and he chose none. Didn't want to get hit by random missile fire in the underbrush. I was easily dislodged from the small house, and put two units of hearthguard and the Warlord in the large church. 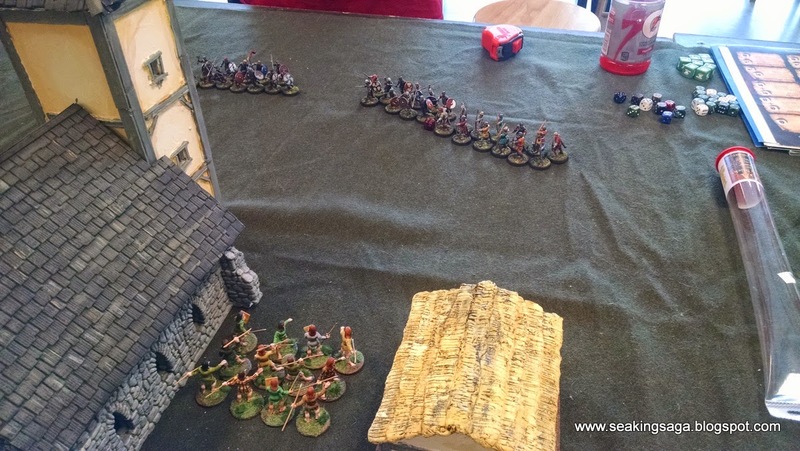 When one unit + 1 hearthguard were wiped out, I moved a unit of warriors into the church that I was keeping by the backdoor. Again, my win was based on playing the victory conditions and I still held one building, in which was a unit of warriors, and encircled by javelin throwing levy. But, I was slaughtered in kill points. I lost the warlord, three units of hearthguard and a unit of warriors. 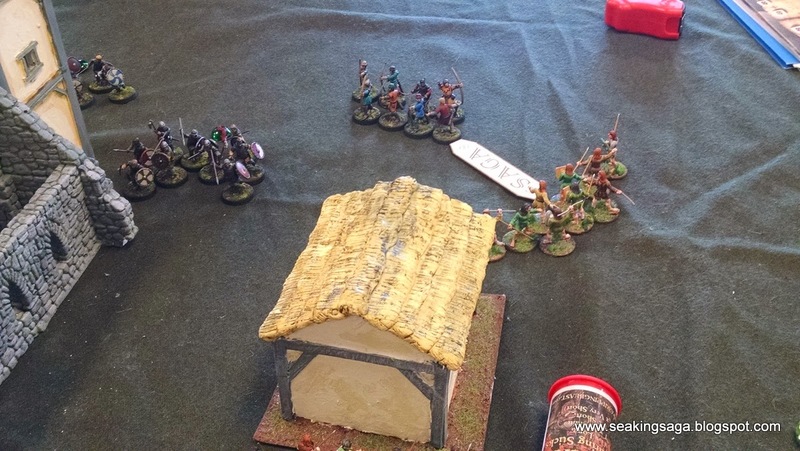 The Saxon player was Sean and we laughed at the amount of dead Irish and Saxons that must have been filling up the doorway of that church. A great guy to talk to and game with, and in fact, everybody I met that day was welcoming and and a pleasure to meet. I won three and tied one match, which won the tournament by win/loss record, though I don't think I was even in third place in terms of number of kill points or bonus points. I believe Henry took that honor. The last two wins were based on those particular scenario victory conditions. Which is a fair win, I guess, and nobody should ever expect the Irish to stand and fight shield to shield. We hit, run and hit some more. Also, I need to get sharper for tournament play. I realized that I had been playing movement through uneven ground a bit wrong, and I have a bad habit of not remembering to put fatigues on friendly units if a unit was wiped out within S. I also thought that Warlords were immune to that particular fatigue, but I may have been mistaking it for the special ability of a named hero. Those might be common mistakes, I sometimes see players using the Warlord's Activation for shooting or resting, which is not allowed. So it is good to get out, play with others, learn some new tricks and, most of all, have fun! 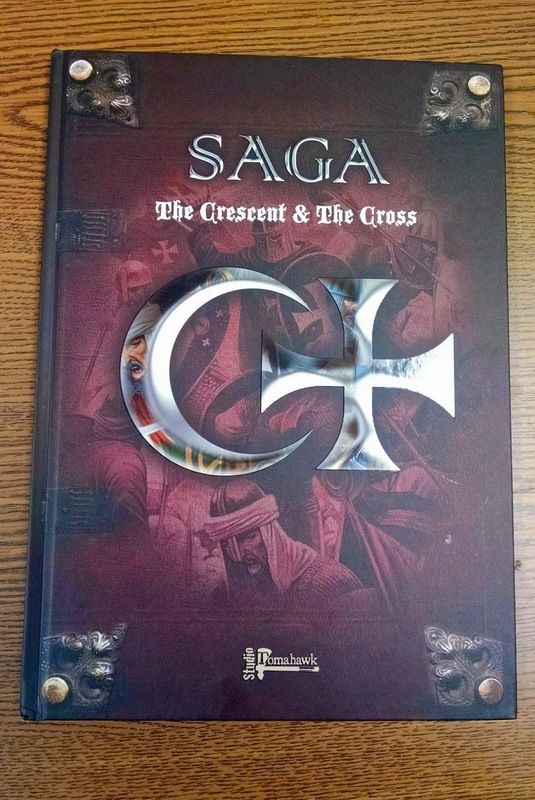 Inspired by the accounts of the Crusade, I am here to offer up a little Latin and my first thoughts on the newly arrived copy of The Crescent & The Cross. The quick reference sheet is useful, but it should have been two sided. That would have made it less "quick" I realize, but enough special units and new rules have been added to C & C. Barring that, printing it on the same cardstock as the Battle Boards would also have been nice. Six high quality boards on slightly heavier stock than SAGA's early releases. All feature a parchment style background, but each faction has a unique iconic image in the bottom corner. The Spanish have a helmet and crossbow, and the Saracens a jeweled dagger, for example. Production Quality: - A nicely bound hardcover printed on quality paper stock. The color printing is vibrant, but without the glare of a cheap magazine. As with many recent game rules, a good portion of the pages are composed of generously sized pictures of miniatures. This does increase the page count and production costs, raising the price of a not-inexpensive book even higher. I am fine with this overall, for enough of the pictures are play examples. The quality of the writing is much improved from early SAGA releases, with their the typos and translation difficulties. A humorous tone is maintained throughout, reminding the reader that this is a fun game, and not a serious simulation. The Rules - The rules look like the SAGA we know and love, with the addition of a new narrator Hashim ibn Khalid ibn Abad. Our old friend Ragnar shows up, most often when there is an addition or deviation from the previous rule set. One such addition I noted was the inclusion of the Priest. Priests can be included with your Warlord, or they can be played as your Warlord. Furthermore, there are three different types of priests to choose from. This, along with the Dogs of War and weapon options allows players to customize their warband into their own thing. With old SAGA, you knew what to expect if you were going against the Vikings, the Normans, the Welsh, etc. 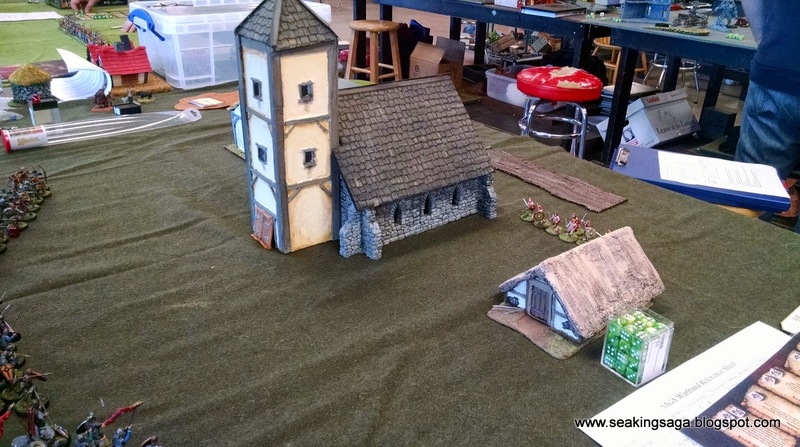 With C & C, you might know the abilities of your Crusader opponent, but how about if your Crusader opponent was led by a warrior-priest with a troubadour, along with a unit of Turcopoles? Something to think about. I really cannot criticize the rule changes or additions in C & C yet, especially without a fair number of play-throughs. 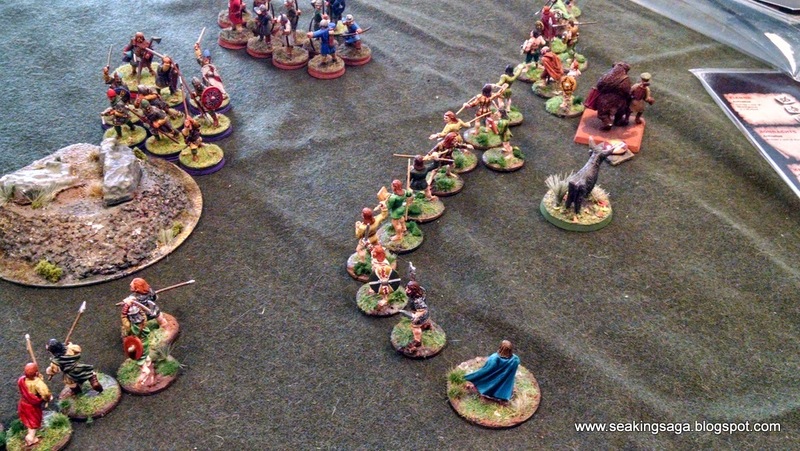 The rules look good, and the success of SAGA should be assurance that QA is even tighter. What was missing or needed? I can see a case made for a campaign system, and this would have been the ideal time to release it. However, those rules could be in a future expansion (you know they are coming) and I don't really hear a demand for it, at least from my small circle of fellow gamers. 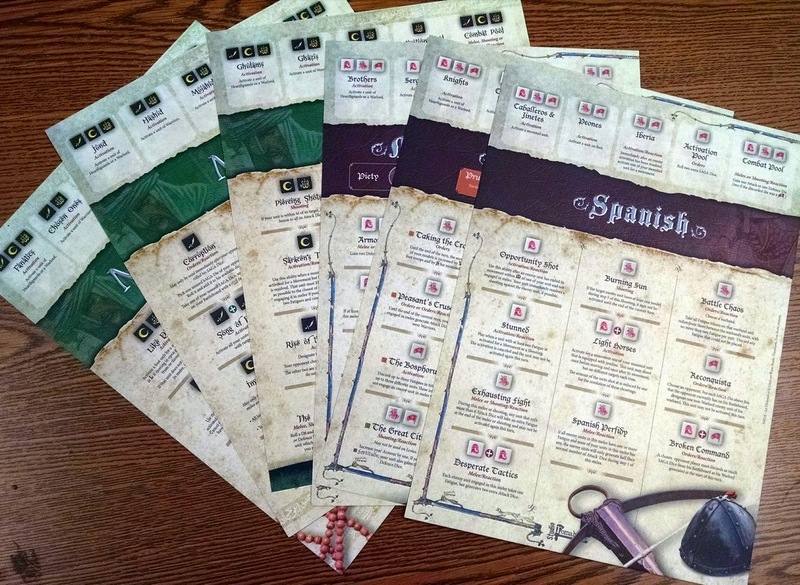 The Factions - The layout and explanations are much improved. The Legends choices are good, and I have to love El Cid and Rachid al Din (The Old Man of the Mountain). The inclusion of some are a bit perplexing. Saladin is very well known of course, but if he was included, why wasn't Richard the Lionhearted? Both probably should have been saved for a Third Crusade expansion. Dogs of War - Bedouin scouts, Daylami, Foreign Mercenaries, Turcomans, Turcopoles, Naffata, Fanatical Pilgrims and the Troubadour. So many options, so few miniatures. Scenarios - disappointed in the lack of a proper siege scenario. In the Crusades, fortresses, whether large or small, were an integral part of many battles. An official siege scenario could have answered a lot of questions - does the defender get fewer points? How is scaling a wall accomplished? 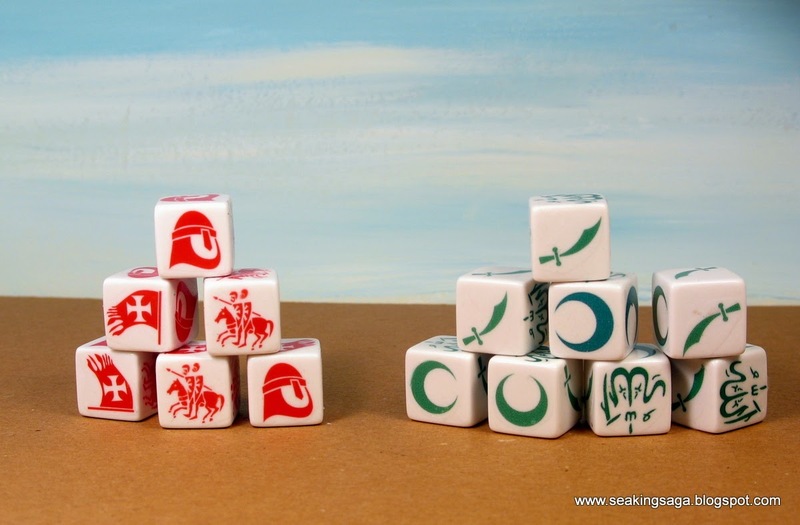 The Dice - while not included with the book, two new sets of dice for the six factions were also released. Again, the fine folks at Studio Tomahawk released image files on their forum for those of us who prefer to homebrew our dice. Here are mine, with the images printed in color on waterslide paper on white dice.